Transparency Market Research (TMR) has published a new report titled “Gene Delivery System Market – Global Industry Analysis, Size, Share, Growth, Trends, and Forecast, 2017–2025”. 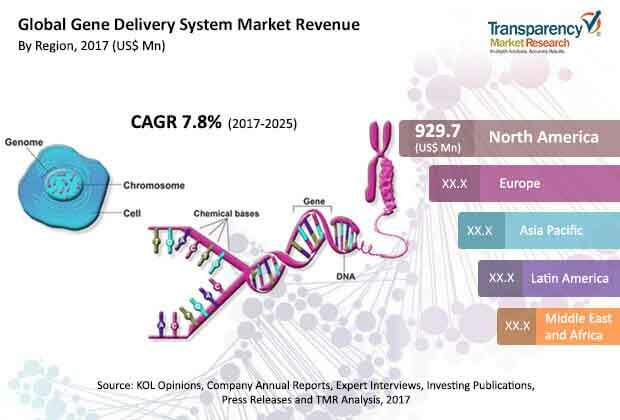 According to the report, the global gene delivery system market was valued at approximately US$ 2,227.8 Mn in 2016 is projected to expand at a CAGR of over 7.8% from 2017 to 2025, The report suggests that increasing in incidence of chronic diseases, rise in technological advancement in administration of drug delivery are projected to boost the market from 2017 to 2025. Key players introduce advanced technologies for drug delivery systems in North America and Europe; therefore, these regions are likely to account for a dominant share of the global gene delivery system market. Changing lifestyle and increase in incidence of chronic diseases in emerging markets such as China and India are likely to boost the market in Asia Pacific. The market in the region is expected to expand at a CAGR of around 8.6% from 2017 to 2025. The cost of gene delivery system is significantly high, hence it is not affordable to all income groups. Additionally, lack of reimbursement in developing and under developed countries is likely to restrain the market. For instance, the cost of Spinraza, marketed by Biogen and used for the treatment of spinal muscular atrophy, is around US$ 750,000 per patient in the first year and US$ 375,000 annually thereafter. The cost of Cinryze, marketed by Viropharma used for the treatment of hereditary angioedema, is more than US$ 417,000 per patient per year. Moreover, rise in incidence of rare diseases increases the demand for treatment options. This, in turn, increases the cost of treatment due to less availability. Gene delivery targets only the affected region. Hence, stringent regulations lead to drug recalls. Therefore, gene delivery drugs are not sold over-the-counter. The report offers detailed segmentation of the global gene delivery system market based on delivery system, application, and route of administration. The delivery system is segmented into viral gene delivery system, non-viral gene delivery system, and combined hybrid delivery system. The combined hybrid delivery system segment is expected to lose market share during the forecast period primarily due to increase in demand for viral gene delivery system. Rise in incidence of genetic disorders with a different pattern of inheritance increases demand for gene delivery systems worldwide. Increase in application of viral gene delivery for the treatment of several chronic diseases such as cancer fuels the segment. The non-viral gene delivery system segment is likely to maintain market share during the forecast period. Several advantages of non-viral vectors over viral vectors such as lack of immunogenicity, low toxicity, and potential for tissue specificity drive the segment. Based on application, the oncology segment dominates the global gene delivery system. Increase in incidence of cancer worldwide, drives the segment. According to WHO report (2017), around 1 in 6 deaths occurs due to cancer globally. The urology segment accounted for market share of 7.0% in 2016. The segment is a projected to expand at a considerable pace due to increase in number of chronic kidney diseases and rise in incidences of kidney and liver cancer. According to World Kidney Day a global awareness campaign, 8% to 10% of adults have some form of kidney disorder globally. In terms of route of administration, the injectable segment dominated the market with share of 43.8%. The injectable route of administration is used for rapid drug absorption. Drugs with low oral bioavailability are administered through intramuscular or subcutaneous route. The inhalation accounted for a small share of the market in 2016; however, is expected to lose market share during the forecast period. Drugs used for the treatment of lung diseases such as bronchodilators and steroids are administered through inhalation to achieve rapid action. The market in Asia Pacific is expected to expand at a CAGR of 8.6% during the forecast period. Asia Pacific constituted 19.8% share of the market in 2016. Increase in incidence of several acute and chronic diseases in Asia Pacific drives the market in the region. India has high incidence of infectious diseases such as tuberculosis. According to WHO report (2015), India had 2.8 million tuberculosis patients, which was nearly 27.3% of global TB incidence, followed by Indonesia (9.8%), and China (8.8%). North America and Europe account for significant share of the global gene delivery system market due to increase in prevalence of cancer in these regions. According to WHO report 2016, 31% of all deaths were caused by cancer and 2% by diabetes in France. Leading players operating in the global gene delivery system market include Novartis AG, Amgen Inc., Oxford BioMedia plc., SIBIONO, Shanghai Sunway Biotech Co. Ltd., Pfizer Inc., Bayer AG, Johnson & Johnson Services Inc., Human Stem Cells Institute, and Epeius Biotechnologies Corporation. Strong gene delivery system pipeline to drive the global gene delivery system market.